A FWP program teaches women how to ice fish, and hopefully gets more women involved in the outdoors. I gave it my best trying to kill a mountain quail over the holidays, but I remain five of six on the species native to the United States. I've added an additional hurdle on my quail slam challenge in that I want to hunt them in the mountains of Southern California near my hometown of Riverside. I might have better luck in Nevada or Oregon, but that would spoil the fun. Unfortunately, the closest we came to finding birds were these tracks. Here's my column on the hunt. Here's a link to my latest "Out of Bounds" column from the Flathead Beacon on the advantages of winter pheasant hunting. Here's a link to my latest "Out of Bounds" column on developments in laboratory-engineered meat, and why it will never be a suitable option for hunters. This column was inspired in part by a conversation with Tim Carman, a food writer and reporter at the "Washington Post." Here's a link to Carman's story on lab-produced bluefin. Here's my most recent column on catch-and-release fishing and a potential new line of attack on angler conservationists. It's no secret that animal rights zealots hate hunting. Catch-and-release fishing, on the other hand, has been heralded as a great conservation tool in Montana and anyplace sport fishing is popular. But new, and stunningly myopic research hints at a new line of attack: it's bad for fish. 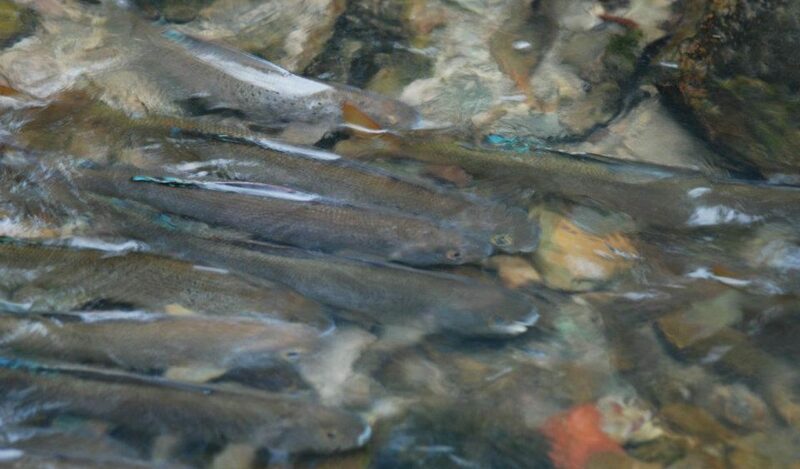 Healthy trout populations in heavily fished Montana rivers and streams say otherwise. In a recent column I outlined my preference for beer over stronger spirits after a day spent afield. But when I do reach for the strong stuff, bourbon is my beverage of choice. I also outline my specs for a proper bourbon Manhattan. Here's my latest column Out of Bounds column in the Flathead Beacon. I made it back to my favorite chukar spot recently, and managed to find a few birds. Doll, who doesn't always care for having her picture taken, otherwise had a great day.